I came across another Margaret at the Lansdale Arts Festival 2015. I was looking for a basket to hold my keys and wallet and other miscellany, and of course this fabric one in orange caught my eye. Margaret DeCook calls herself The Versaltile Artisan and hails from Allentown, PA. I wrote a check for my purchase, and she said the only other check she received that day was from another Margaret. We were out in force. I believe she was the one that asked the question I usually pose: Do you go by Margaret? She goes by the whole thing, just like I do. Margaret is a name that has a multitude of nicknames, and people have the tendency to pick one and apply it, but I recognize myself in Marge, Peggy, or Maggie. Basket by Margaret DeCook. Mosaic Mirror by Margaret Almon. 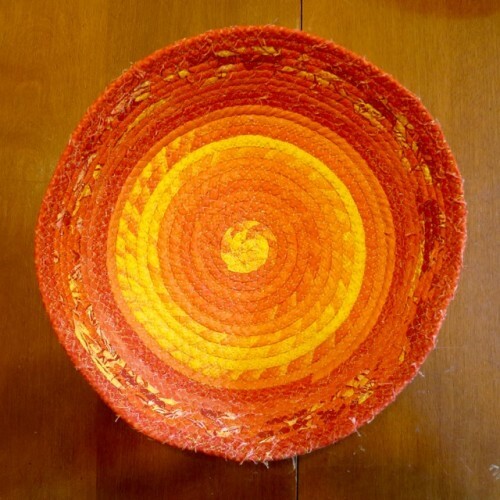 I love how this fabric coils around in yellow orange from the center, and then incorporates red orange up the sides. It’s called a Centerpiece Bowl, and I will use it to help center me, and keep important objects in one place. I once read a book on organizing where the author said as long as you keep things moving in the right direction, point them on their way, that was good enough: the receipts on the shelf, ready to travel downstairs, the coffee cup from nightstand, to dresser and then downstairs. I still imagine the objects in my house on a journey toward their home place. 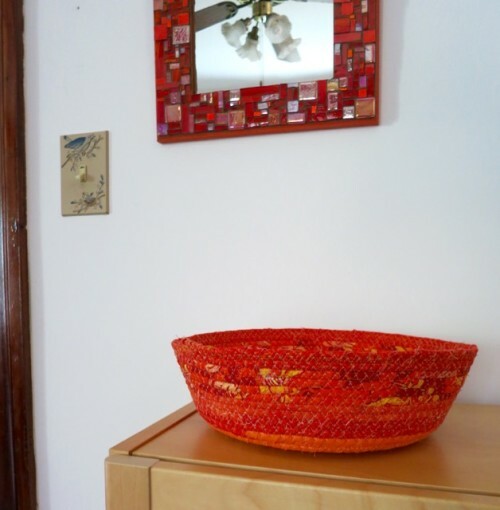 A few months ago I read Marie Kondo’s The Life-Changing Magic of Tidying Up, where she advocates keeping only those objects that “spark joy” ~ this orange basket has the spark. What a lovely surprise to read your comments about the centerpiece bowl you purchased from me in 2015! I love working with oranges, yellows and reds. Placed beneath your mosaic mirror creates a lovely balance. Thank you for creating such a beautiful bowl! I use it everyday!